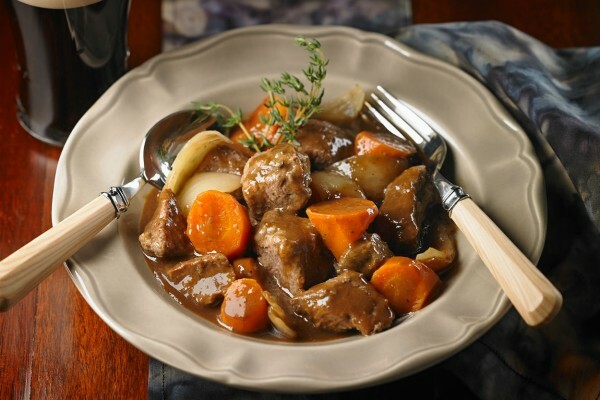 If you can’t get to Ireland for the annual four-day St. Patrick’s Day Festival in mid-March, raise a glass of local craft beer and celebrate at home with our easy Irish dinner. Take Colcannon. Songs and poems have been written about this beloved Irish mash-up of potatoes and braised cabbage. Pat leftovers into patties and fry until crisp and golden in bacon fat for a weekend brunch. After dinner, try both of our decadent desserts. The first is a light-as-air Sponge Cake with Caramelized Apples, topped with honey-glazed McIntosh apples. Since the Irish love puddings, we created Warm Carrot Puddings with Irish Cream Sauce. Made in muffin cups, these moist individual puddings come with a sticky caramel sauce spiked with a wee dram of liqueur.